Matthew Ostrowski (NYC) is a pioneer in live electronic arts, having worked as a composer, performer, and installation artist for over 20 years, exploring alternative controllers, multimedia, and theater. An unreconstructed formalist, he has had a continuing interest in density of microevents, rapid change, and using technology to stretch the bounds of perception and experience. 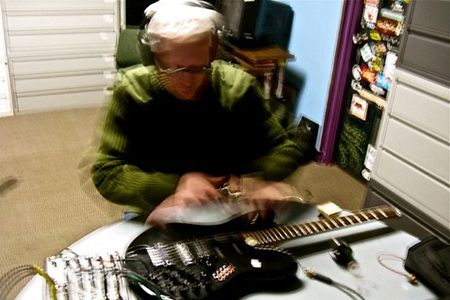 Doug Theriault (Portland) is concerned with the development of live electronic music systems on custom-made instruments of his own design. Mostly known for his highly idiosyncratic guitar work, he uses varied organic and electronic sound instrumentation, light gradients (sensors), space and performative movement in connection with the conceptual development of live electronic music systems that he has created. Gyre (Seattle) is an experimental electronics trio formed by Michael Shannon, David Stanford, and Carl Lierman. The group’s working method relies on the use of non-standard configurations of a wide cross-section of analog and digital electronics. Each creates discrete circuits between these elements that, while they can sustain sonic form, are not always stable. Sounds generated entirely with oscillators, internal and external feedback circuits, simple sound generators, microphone captures, digital processing, forming swirling loops of sound layers.